The UK will need a transition period to help businesses adjust after Brexit, the chancellor and the international trade secretary have said. In a joint Sunday Telegraph article, Philip Hammond and Liam Fox stressed any deal would not be indefinite or a "back door" to staying in the EU. Their comments are being seen as an attempt to show unity between rival sides in Theresa May's cabinet. The Liberal Democrats said Mr Hammond had "been brought back in line". "What this is about is getting Philip Hammond back on track with a hard Brexit program," Tom Brake, the party's foreign affairs spokesman, said. "What we don't know from this letter is exactly how this is going to work. It's also not clear how long the transition period is going to be." The letter comes as ministers start to set out their detailed aims for Brexit. A series of papers is being published, including one this week covering what will happen to the border between Northern Ireland and the Republic after the UK has left the EU. Writing in the Sunday Telegraph, Mr Hammond and Mr Fox said the UK definitely would leave both the customs union and the single market when it exits the EU in March 2019. They said a "time-limited" transition period would "further our national interest and give business greater certainty" - but warned it would not stop Brexit. "We are both clear that during this period the UK will be outside the single market and outside the customs union and will be a 'third-country' not party to EU treaties," they said. They said the UK's borders "must continue to operate smoothly", that goods bought on the internet "must still cross borders", and "businesses must still be able to supply their customers across the EU" in the weeks and months after Brexit. The two leading politicians said the government wanted to ensure there would not be a "cliff edge". Labour MP Ben Bradshaw said leaving the single market and the customs union would be a "dreadful mistake for the future of our economy, for jobs and prosperity in Britain". 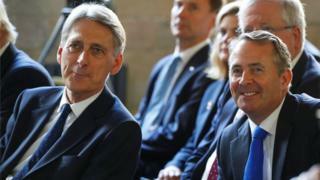 BBC political correspondent Ben Wright said Mr Hammond - who is seen to favour a "softer" approach to Brexit - and Mr Fox, one of the most prominent pro-Brexit ministers, had "previously appeared at loggerheads" over the government's strategy on leaving the EU. Mr Hammond has raised the prospect of a Brexit deal that saw little immediate change on issues such as immigration - something Brexiteers have rejected. Our correspondent said their article was an attempt to "prove cabinet unity on Brexit". Conservative MP and Brexit minister David Jones said the letter showed Mr Hammond had "rowed back from his previous position". But Stephen Gethins, from the SNP, said there was "no masking the fact there are deep divisions within cabinet over Brexit - and still no apparent plan almost 14 months on from the vote". Image caption David Miliband said Brexit was an "unparalleled act of economic self-harm"
Meanwhile, former Labour Foreign Secretary David Miliband has called for politicians on all sides to unite to fight back against the "worst consequences" of Brexit. He described the outcome of last year's referendum as an "unparalleled act of economic self-harm". Writing in the Observer, he said: "People say we must respect the referendum. We should. But democracy did not end on June 23, 2016. "The referendum will be no excuse if the country is driven off a cliff." Negotiations between Brexit Secretary David Davis and EU officials are set to resume at the end of this month. Mr Davis said the publication of the papers outlining the government's aims for Brexit would mark "an important next step" towards delivering the referendum vote to leave the EU. What chance for a new 'centre ground' party in the UK?